– Doubles in Debe – Who should we try in Debe? Any doubles recommendations for Diego Martin/Petit Valley; Chaguanas/Central; or Tobago? Also, let us know if you tried the newest twist on doubles — CHINESE DOUBLES (Choubles). You can find the Choubles man in Woodbrook on the corner of Ariapita Avenue and Petra on Friday and Saturday evenings starting at 6pm. Tags: Trinidad Tobago Food Finds, Trinidad Tobago Street Food. Bookmark the permalink. So many great doubles, each there own flavour, it’s impossible to choose and every year that i visit there is another one i find i like the most, this year i particularly liked the doubles at the of hirg street (library corner) in san fernando, the one with the mango sauce, or just go debe – any shop – anyway, i have a whole different problem – where do i find a proper doubles recipe, and i mean THE recipe, i ve made them 3 times now and somehow the bara are never soft enough, and unfortunately here in amsterdam there is no doubles man on the corner so i will have to make them if i want some 🙂 any tips are very welcome!! Try Yulie’s doubles in Sangre Grande – inside the maxi hub. They make it on the spot. This man doubles even better than Sauce curepe and Persad’s princes town doubles – sweet hand for days…red shed, Linsencing Office San Fernando! Silver van just off chase village flyover opposite globecity. Made on the spot, really good roast pepper and coconut chutney goes well with this already tasty doubles. Lall by the old Air port. his pies are also really good! have any one of guys tried Brandons hot an tasty doubles in front the Arima market he is the best in Arima . Tony’s Doubles at the bottom of the Lady Young Road, Morvant. They’re never there on Mondays and pick and choose what days they’ll be present from Tuesday- Friday. Doubles factory in San Juan. And the man by roxy. The best is Persad’s doubles by the wharf in San Fernando and on Mucurapo Street San Fernando. Please remove George and George X from this discussion. Shine’s (Wrightson Road, in front of the Licensing Office, early weekday mornings) – the best. Also, Maraval Road, opposite Sweet Briar Road, early weekday mornings. The Doubles stand opposite Medford Unipet gas station in Chaguanas is run by a family and they’re from the area so there’s fresh channa and bara delivered every few hours. Their doubles are the second best I’ve ever had. First place goes to the bearded doubles man who sells in the Queen’s Park Savannah on most friday and saturday nights. I agree with you Maria, I have had the doubles a few years ago by the gas station in valsayn and I must say that Medford doubles is the best. But you have to get the right brother there, as they share the location but have different cooks. Hmmmmm Ali’s on the main road, the best! hey have you tried the young fella and his wife next to n.i.b. in st. james they are the best in st james main road.The softest bara the tastiest dressings the doubles just melts in your mouth you should try them in the morning period. The doubles man name is Pooran’s doubles. You should try the doubles on the corner of Cipriani Boulevard and Tragarete Road. But there are a few vendors that sell there. I am referring to the one who sells Sun-Wed in the afternoon/evening (3:30pm-ish – 6:30pm-ish). There are a couple vendors on that list that are not my taste, UWI doubles and George X for example. The doubles outside Long Circular Mall is no longer available outside Long Circular Mall. They’ve relocated to somewhere else nearby in St James. I don’t remember the name of the street. Same doubles is available from Maraval Road, definitely top 10. Mamoo’s doubles opposite Center of Excellence Macoya. Boy I have eaten doubles from Mayaro to Cedros and these guys are by farthe BEST I have ever tasted. Do ask for the coconut chutney as well as the cucumber chutney.I would pay extre for this doubles, but I hope his price remains the same. I dare anyone to taste this one and say that they have had a better doubles after!!!! J and S doubles on El Socorro road…close to the highway side. What about Frank behind UWI doubles !!!! They take all UWI customers !!! The guys opposite Medford gas station in Chaguanas, but go in the evening, the ppl there during the day aren’t the same…. Central: By Medford gas station is a top doubles and pies place, but if you get there before 8am, then the barra is so new that the edges are still crispy, then yuh good! South: the Debe stretch has the one spot that stands out above the others, but I now forget the name- the channa is always perfectly soft, so there is always a line up….but they serve all day, and into the evening, so if you don’t have any other reason to visit Debe- there’s one now. PS: UWI double is de wuss. Please remove it from any discussion. I think UWI doubles is what dead all dem corbeaux…. UWI doubles is a mess….Best doubles in Trinidad are Sauce in curepe and Marlene’s Marabella (by Intercommercial Bank). 1. Ravi’s Doubles on Barker Ext Rd i.e. when you bypass Grande using Paul St.
==Open Google Earth and type in these coordinates 🙂 Lat 10°34’14.01″N ;Lon 61° 7’55.72″W . They are usually open on mornings they sell out about 9. 3. Evening doubles -get them at Datoo’s located just west of the roundabout under Eastern Pharmacy. and seriously.. UWI Doubles???? aww come on man.. no way. Try Persad’s Doubles in Princes town, they have been around for over 50 years for a reason. Chaguanas: Bara Boys opposite Medford Gas Station. Diego Martin: Starlight Shopping Plaza. lady by Hilo carpark. For sure: siparia doubles, outside diptee’s hardware during the week, infront rbtt/cathy’s photostudio on sunday. worth the trip. best of all is $3!!!! eat ur belly full! Love to see that our famous Sleepy’s getting major props on TriniChow! Ask them how the name Sleepy originated next time you visit! Peggy in St. James. He’s right outside the Chinese restaurant Wok Master opposite Bike Inn. 7. Finally, two honourable mentions: Central Doubles off the Chase Village Flyover just west of the hardware and the guy opposite Medford gas station. 7. Finally, there is a concrete hut located on the Chase Village flyover but I haven’t seen them open in a while. UWI Doubles definitely out……..I had gravel in my channa and when I returned it the woman replied if i want another one…….woman why would i ever want another UWI doubles from you!!!!!!!!!!!! !………….plus their service stinks!!!!!!!!!!!!!!!! !……However In the lot behind there is Frank’s Doubles…….That is the best in Curepe for me……..
uwi doubles should definitely be taken out! sauce under the green shed and suace under the red shed by the maxi stand in curepe are in my top 5, i also really like doubles factory in aranguez extension mainly because its being made in front of you, its actually located in the ppl back yard and theres seats and moms as she’s commonly known as is very nice. Debe and the 2 dollars place top off my list. I would take out UWI doubles and Debe doubles from the list (but go try them and see for yourself). When you go to Penal and try the $2 doubles place, go across the road by the road and try the popular doubles man there as well. His is supposed to be really good. As you head further south toward Siparia from Penal, there is a doubles man right before the “Y” junction to go San Francique. He is on the left hand side by a shop. His is good. Also, I believe his relative sells in La Romain by the old cinema. His also is good (possibly same recipe), but it has been hit and miss a few times I went lately. There is a good doubles man on the North side of the Highway just off the turn off by Aranguez. The doubles man outside the bp building on Victoria Ave is pretty good. He is usually there from 6-8am. I usually judge a good doubles man by the line. If the line is long, then I’ll join it! Oh…the lady’s name is Mala and I truly believe that her doubles (though hardly known nationwide) is one of the best in Trinidad!! I also discovered that she also sells on Centenary Street on Friday afternoons. Seriously, her doubles is da bomb!!!! Thanks, Usha we’re adding her to our list to try. I wouldn’t judge a good doubles by its line because it don’t necessary be good but because some people just accustomed buying from their doubles man for a long period of time. Now seeing this, haven’t checked the post in a while…. Sham is actually Sleepy’s brother. There are a few of them in that family in the area that sells doubles (eg another brother right after Joe Singh’s factory)… there is some similarity among the taste for them… but $4.75 for a doubles at Sham’s is just a weird price. yes….i startting to believe that the whole family is into the business. there’s another brother who sells in the airport and the cousins who sell at varying points from st helena to kelly. and yes, i agree that Sham’s price is weird (as well as a bit costly for a doubles, especially since the no vat clause passed), but i’m not much a fan of doubles with curry in it, so prefer Sham to Sleepy…. 2. Khans’ s right in pos on the brian lara prom. Caroni Savannah rd. it have a woman…she in d top 5!!! cant believe u guys forget chaguanas!! Chk out Darrins Doubles in Maraval beside RBC on rookery Nook!! Ooh thanks Kiki, driven by Darrin’s Doubles many times. Now we know it’s ok to stop for these doubles! Best Doubles I ever ate, guys opposite Medford Gas Station in Chaguanas. 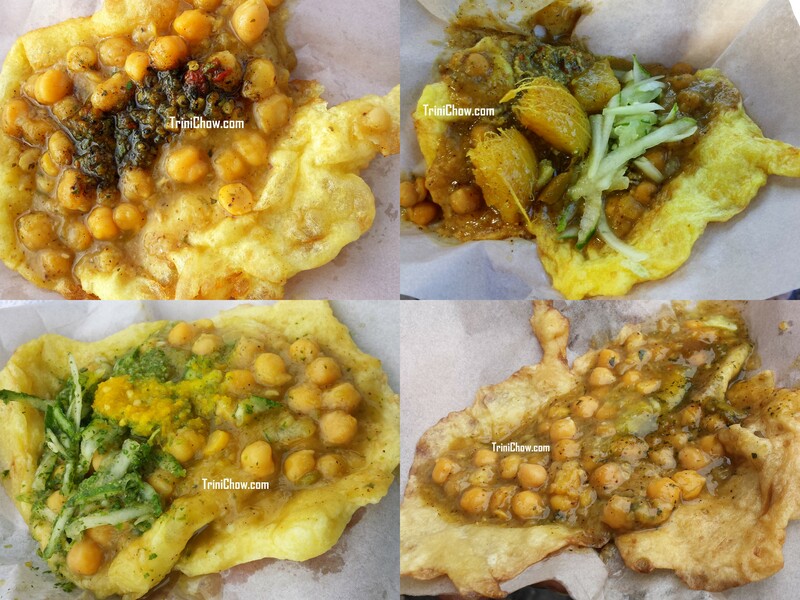 They have all the sauces: sweet, tambrind, pepper and cucumber, the bara is tender and tasty, channa is just the right consistency and delicious, these doubles are ALWAYS piping hot! Its a must try. In Tobago, there is an indian couple that sells in the market carpark in Scarborough, they are really good, better that lots of them in Trinidad. Thanks for the Chaguanas and Tobago recommendations. Are the Tobago couple out everyday in the carpark? Kathy knows what she is talking about. Here de sweet sauce maaad….George X has the sauces and cucumber done properly, too. I am rather partial to Sleepy and Son located in St Helena Village, Piarco. They are located close to the gas station next to the little fruit stall. I drive all the way from Santa Cruz on Sundays just to get some and take little containers to pack for the week! And what dear Trinichow is your verdict? Hi Suraiya, we haven’y tried Sleepy & Son yet. We’re due for a trip to the airport in the next few days. Do you know if Sleepy & Son are open on Saturdays? Yes, they are there on Saturdays… but sometimes can sell out by 9:30… I can’t tell you how many times I woke up on the weekend, left Santa Cruz drove up there to find out the doubles done. I have a number to call them and check if they are still selling. Thanks Suraiya, we would love to have the number! Please send the number to info@trinichow.com. Thanks Stacy, we’re adding Frank’s to our list of doubles to try (folks on Facebook are recommending it too)! Frank’s is the best in T&T!!! !